I have been thinking of some things about the reunion and of things to maybe vote on or talk about. 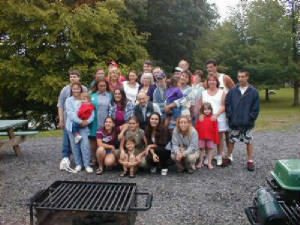 Does anyone like the idea of some other type of reunion other than a picnic or in addition to a picnic? Or might it be a good idea to have say, a two day reunion. Some families meet and take vacations such as cruises or some other type of trip or rental type place at a beach or resort. Do any of these things sound interesting? How about putting together a family cookbook? If someone would like to do it and compile it for a printer or we could be less extravagant and just compile them ourselves. i think it would be a lot of fun and a wonderful keepsake if we could have some family favorites. I understand Rusty made another afghan to be raffed so bring your money to buy some chances. You know what beautiful work he does. And if you haven't seen his work, you are in for a big treat. Theodore F. Windhausen March 3, 2007 Ted "GRAMPS" Windhausen, 75, passed away Saturday. Born on May 27, 1931, Ted resided most of his life in Pompey. He served as an MP in Germany during the Korean War. He was a retired truck driver and devoted newspaper carrier for the Syracuse Post Standard. He was married to Betty (Kenyon). Survived by his brother, John (Barb) of Fabius; his children, Ted of Fort Myers, FL, Patricia (Ed) Popcun of Syracuse, Michael (Karen) of North Syracuse, Eric of Lincoln, NE, Stephanie (Scott) Nicholas of Pompey, and Jennifer (Kaje) Windhausen of Brandenton, FL; and his beloved grandchildren, Eddie, Melissa, Charlene, Samantha, James, Geoffrey, Timothy and Amanda. He was predeceased by a brother, Robert (Betty Jane) of Fabius. Ted's favorite pastime was playing cards, and he taught his children, grandchildren and so many others to love the games that he so enjoyed. In lieu of flowers, donations may be made to the F-P Rec-Baseball Program that he so enjoyed through the years watching all his "kids", P.O. Box 7, Fabius, NY 13063. Funeral services are 11 a.m. Friday, March 9, at Hall Funeral Home, Rt. 20, LaFayette. Friends and family may call Thursday, March 8 from 4 to 7 p.m. at the funeral home. Published in the Syracuse Post Standard on 3/7/2007. L. Schumacher April 30, 2007 Captain John "Jack" L. Schumacher, 85, of Perkins Row, Topsfield, MA, beloved husband of Terese "Terry" M. (Windhausen) Schumacher, died Monday April 30, at the Shaugnessey Kaplan Rehabilitation Center in Salem, MA. Born in Albany, New York, February 18, 1922, he was the son of the late Frank B. and Clara (Pennetta) Schumacher. He was raised and educated in Albany. He furthered his education at Sienna College before CLOBFLAGentering the military. An honorably discharged veteran, Jack served his country as a member of the United States Army Air Corps during WWII. He was an experienced and accomplished fighter pilot in the 52nd Fighter Group. He was also well-known through the army air corps ranks as he was a top notch flight instructor at United States Military Academy at West Point. Captain Schumacher's love for flight propelled him into a career as a chief pilot with Eastern Airlines for over 41 years, until the time of his retirement in 1982. In addition to his loving wife of 57 years, Jack is survived by three daughters, Mary Farrin and her husband, Lloyd of Monson, MA, Marsha Russell and Scott Kelly of Salem, MA and Christine Modie and her husband, Richard of Fernandina Beach, FL; one son, Charles Schumacher-Karjane and his wife, Heather of Cambridge, MA; five loving grandchildren, Denise, Suzanne, Julie, Emily and Noah; and one precious grandchild, Luca; and several nieces and nephews and many friends. His funeral Mass will be held in St. Mary of the Annunciation Church, Danvers, MA, Friday, May 4, at 2 p.m., relatives and friends invited. As requested, no visiting hours. Assisting the family with the arrangements is the Peterson-O'Donnell Funeral Home, 167 Maple St., (Rte 62) Danvers, MA. For more information, inquire at 978-774-6600. On line guestbook @ www.legacy.com Expressions of sympathy may be made in Jack's memory to the American Diabetes Association, 330 Congress St., 5th Floor, Boston, MA 02210. Published in the Syracuse Post Standard on 5/3/2007. We always try to take group pictures by clan, i.e. one of the original childrens lines. 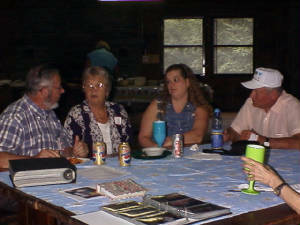 Mary Walton listen to John Windhausen with Helena Campbell and Herb Walton listening. 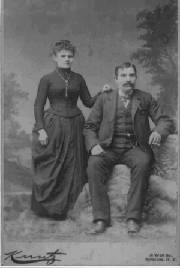 The ancestors of Peter Mathias Windhausen (married 1831) found in a private data collection says the Windhausen family is deeply rooted with the soil. They have been living in the Schwalmtal area at least since the 1680s. 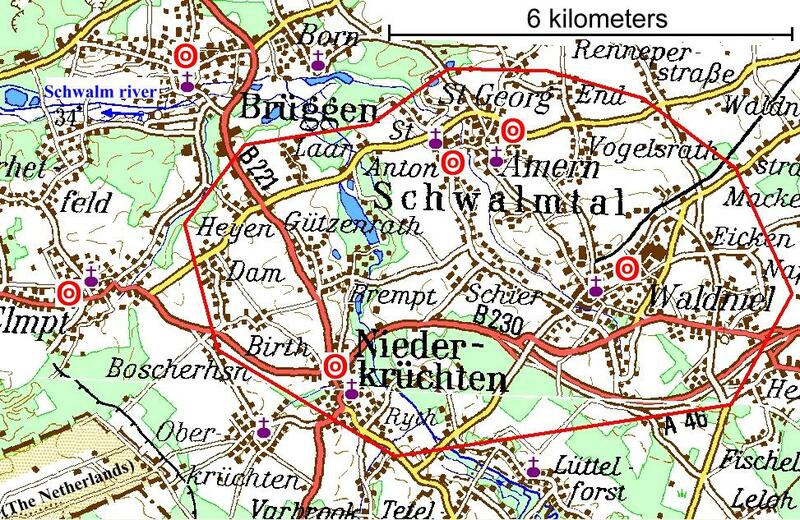 Windhausen is a surname occuring still today quite often northwest of Moenchengladbach city (view map). The marked area is where the Windhausen families occur before 1800. Thanks to Katey Werbeck, we found a family Bible listing, in Peter Windhausen’s handwriting the births and locations of all ten of the original family members who came to America in 1882-83. Despite all of our misguided guesswork from obituaries and other sources, both parents and all eight children were born in Reil on the Mosel River in the Rhineland of Germany. 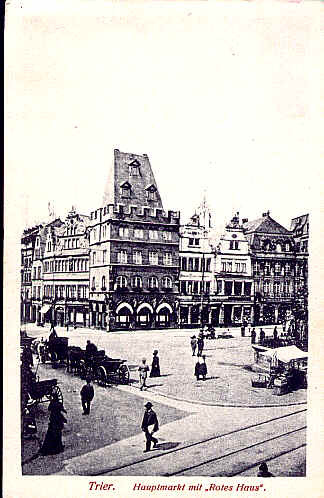 Furthermore, the report traced the family back several generations earlier than our Peter and Kathrina, providing us with the names of several other related families such as the Bauers, Diessens, Barzens, and Haas. What is more, the report showed that the Windhausens came to Reil from the northern town of Burgwaldniel, some 110 miles to the north of Reil and lying in the Catholic diocese of Aachen. Subsequently, discovered that the town of Burgwaldniel and that of Amern were fused with a larger town in the twentieth century called Schwalmtal. Meanwhile John found another genealogist from that area whom he have asked to pursue our Windhausen lineage in this latter region. It is hoped that he can connect our Reil relatives with those in Schwalmtal and discover the earlier roots of the Windhausen clan. Furthermore, Mary Walton found the German telephone book on the web, there appear to be seven or eight Windhausens living in Schwalmtal today. The new researcher may be able to discover whether or not these people are linked directly to us. Mary has also asked a German friend of hers from church to try to get some contact with Windhausens in that area. He said that sometimes they want to communicate with family in the U.S., but that some do not. Position available for an Editor, Asstistant or Helper even?? ?